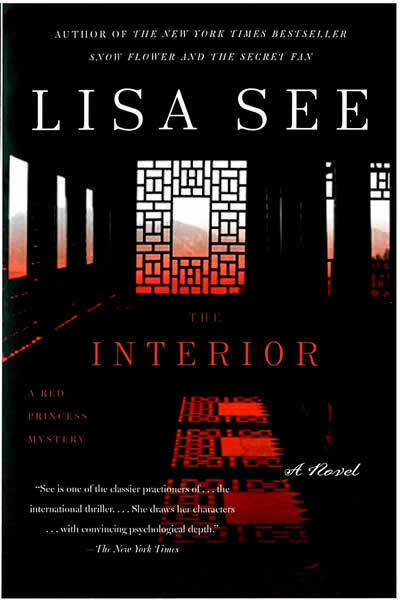 A beautifully written, timely, and suspenseful thriller set in modern-day China, The Interior is the second novel from Lisa See, whose fiction debut, Flower Net, was a national bestseller, a New York Times Notable Book, and a nominee for the prestigious Edgar Award. In Flower Net, Lisa See ripped away the veil from modern China, its venerable culture, its teeming economy, its institutionalized cruelty. In The Interior, she probes the mysterious layers of China's vast land and the powerful bonds of family, friendship, and history that run deep within the soil. The Interior brings back the duo of Chinese police detective Liu Hulan and her lover, American attorney David Stark. This time, for Hulan, the case is alarmingly personal, unearthing her own buried past and a stunning network of violence and conspiracy. When an old friend from a village deep within China's interior asks Hulan to find out the truth about her daughter's suspicious suicide, Hulan cannot refuse, even if it means going undercover in a newly built American toy factory linked to David's firm and finding her way into the heart of a dangerous mystery. Meanwhile, David's new job has him trapped in a tangle of legal and ethical dilemmas. To extricate himself, he must first decide whom to trust and where his greatest duty lies. A novel rich in atmosphere and charged with the complexity of Chinese and American relations today, The Interior explores the exciting and fascinating depth of China's most remote regions, where loyalty, greed, and love collide with terrifying consequences. "Lisa See is one of the classier practitioners of that ready-for-Hollywood genre, the international thriller. But See does more--she draws her characters with convincing psychological depth, and she offers up documentary social detail that reeks of freshly raked muck. See's China is as vivid as Upton Sinclairs Chicago." "See paints a fascinating portrait of a complex and enigmatic Chinese society, in which nothing is ever quite as it appears, and of the people, peasant and aristocrats alike, who are bound by its subtle structures."